The Etsy shop is open! To get to the shop, just click on 'My Shop' in the menu above. All my items will be available to ship worldwide, but I am still working out international postage costs. So if you are outside of Australia and would like to order, please email me and I will get on it rightaway! The orders have been coming thick and fast, which is slightly overwhelming (though in a good way!) 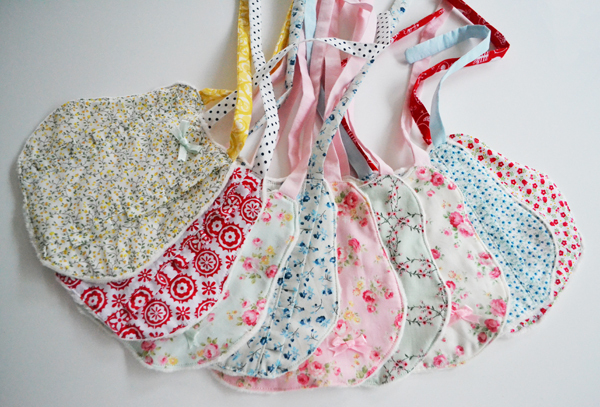 Once I have this inital batch of orders completed, I will put the second bib collection in the shop, so if you are after patchwork bibs, bibs for boys, bibs with snaps, or bibs with personalisation (hand embroidered name) watch this space! 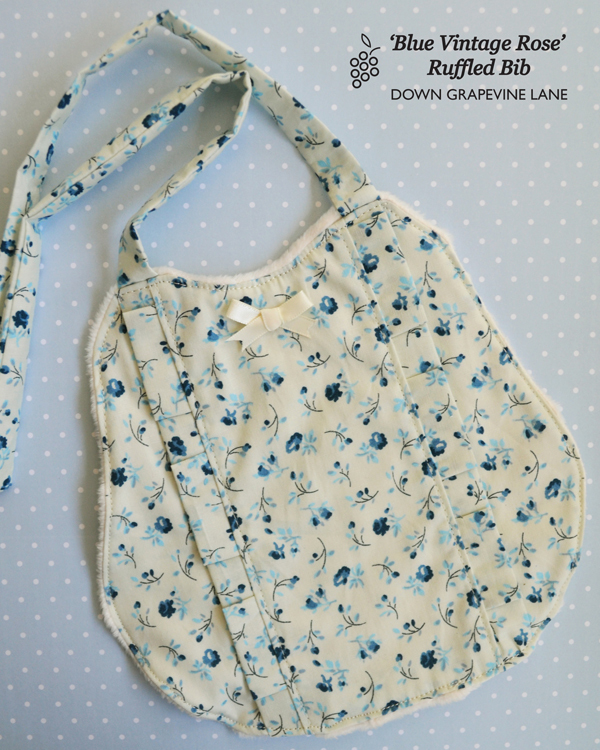 Also, a big thank you to Amy from Nana Company who gave me the inspiration for the ruffled bibs, and my pattern and method for those bibs is largely based on hers, with a few of my own modifications. 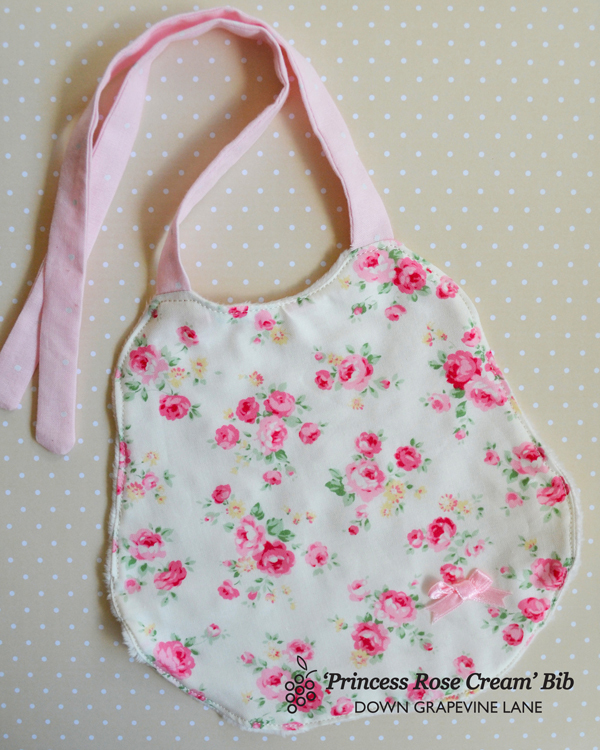 I will be selling other items in the shop too - so it won't just be bibs or even just baby items. I have plans to sell cushion covers, soft cubes/taggies, kitchen items such as napkins, placemats and coasters, and mini-quilts & wall art. All in good time. And I just LOVE this picture of all nine of them together - a stack of fluffy pancakes! I got a free pass to go fabric shopping the other day, all on my own. It was my toddler's childcare day and my husband had the day off and offered to mind the baby. Shopping for fabric without kids hanging off me, such a rare treat! So I headed down to my local Spotlight (for those outside Australia, it's a big fabric and craft store similar to JoAnn's in the US). Now, I normally find the fabric collection at Spotlight very disappointing. 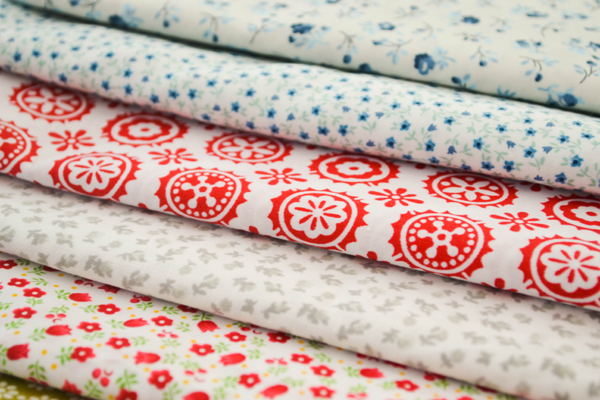 They have a great range of big bold bright patterned fabrics, but a pretty poor selection of mini and micro prints (which I prefer as the smaller prints work better with patchwork). 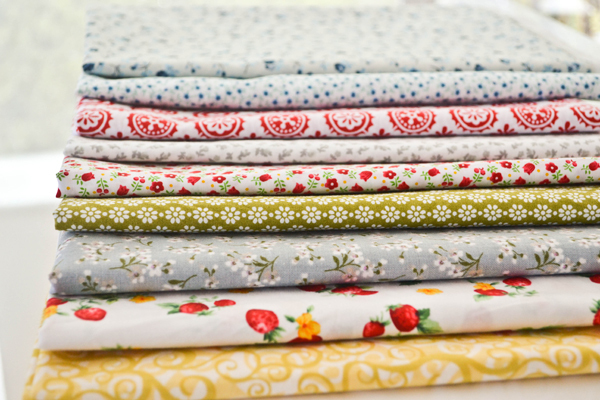 Plus no Moda, Riley Blake, Michael Miller, or Lecien in the quilting section! So I normally purchase most of my fabric on Etsy. I had to put the quilt on hold for a couple of days as I have been designing my first bib collection for the Etsy shop. I spent ages trying to select fabrics and getting the strap/bibfront colour combinations right, sewing up and discarding prototypes. I have been superfussy as, being my first, this collection really represents my style and I wanted to get it just right. 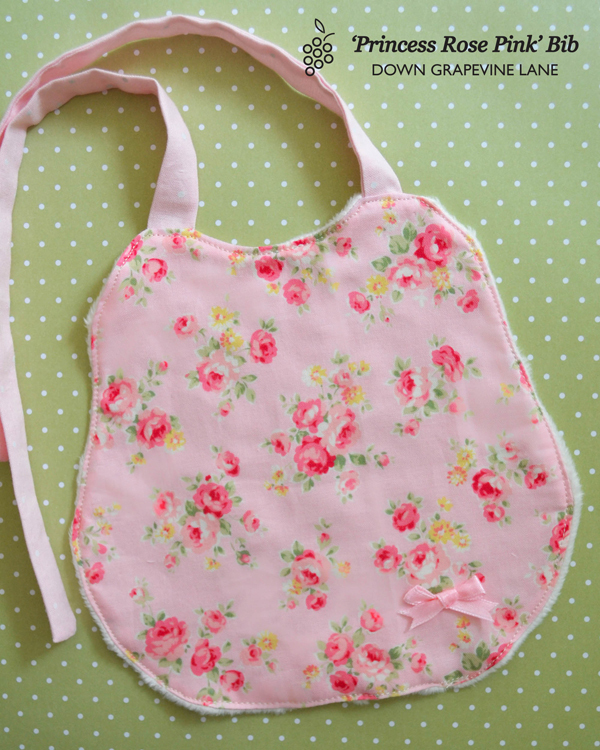 I will post pictures of each bib when they are in the shop in the next day or so, but here is a quick preview. They are backed with minky, lots of fluffy goodness. I decided to name each bib because they are like children to me... 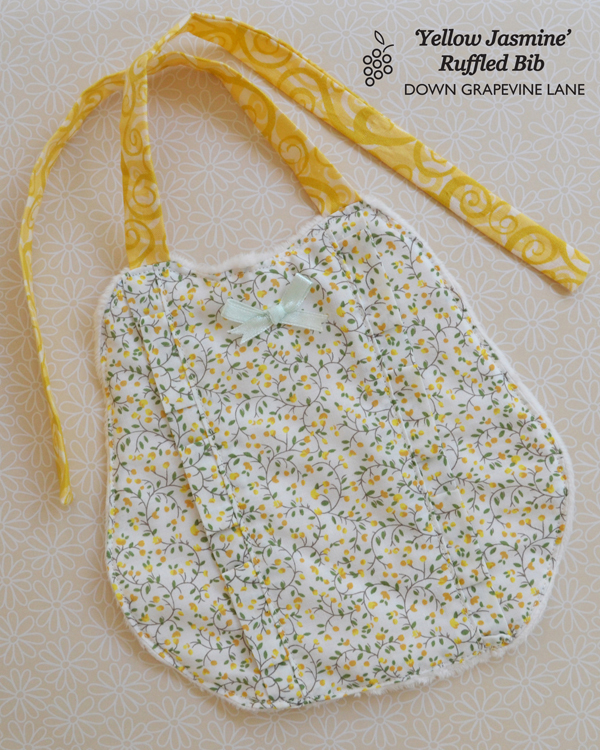 So for instance, the first bib in the picture is called 'Yellow Jasmine', on account of the yellow climber in the fabric and the vines in the straps. I was a bit stumped with the second one though, the one with the big red flowers. So I asked my husband for a suggestion, and the best he could come up with was 'Wheely Red Bib' (yes, he has an unusual sense of humour, but he makes me laugh). 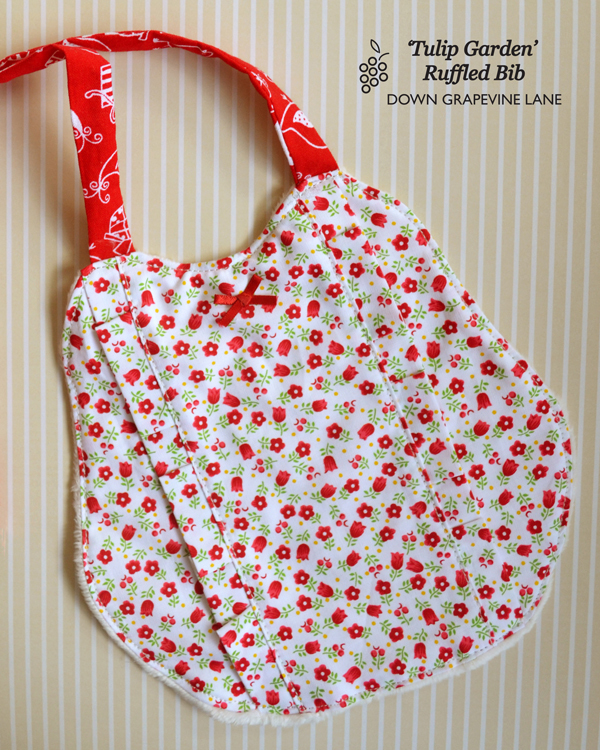 Thankfully a friend suggested 'Scarlet Bloom' and saved the poor bib from a terrible name (even though it now sounds a little like the lovechild of two famous Hollywood actors). 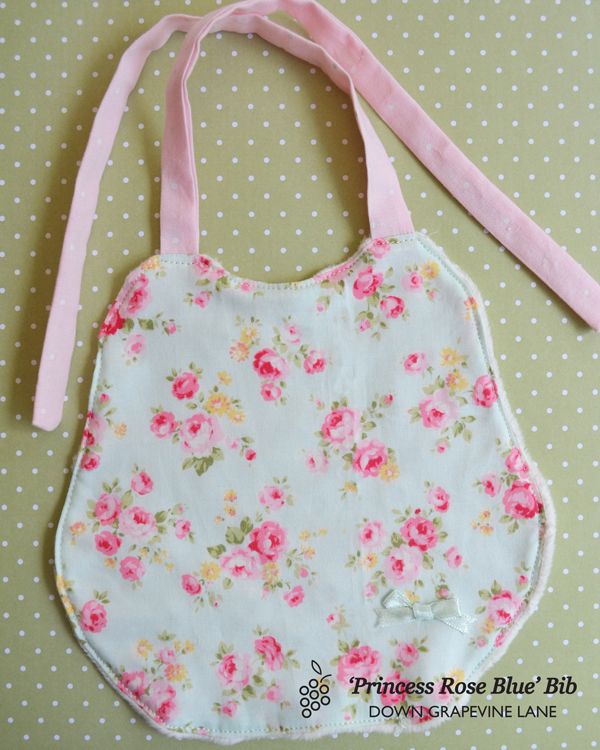 Just need some good daylight now to take photos of each bib, and then they are going in the shop! 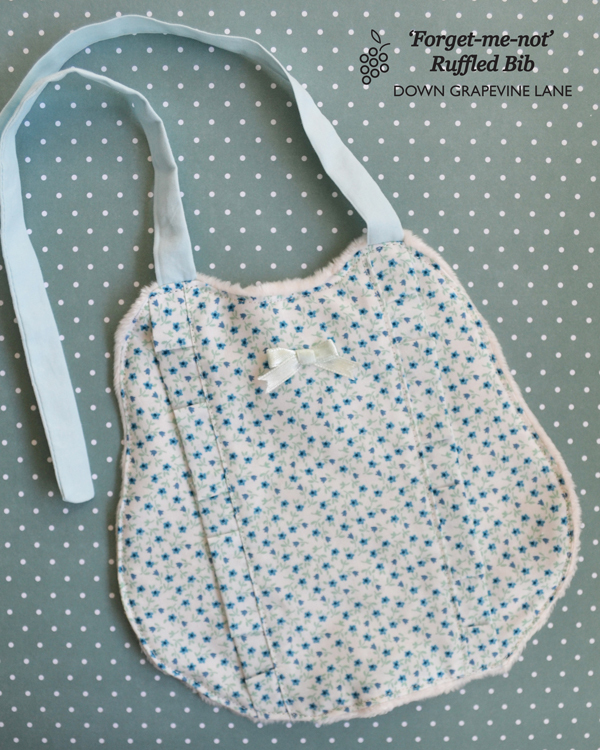 Each bib style will be strictly 'limited edition', as I only have a certain amount of each fabric. 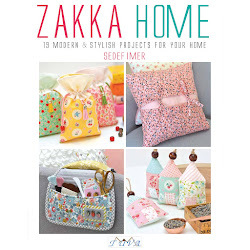 In fact some of these fabrics are discontinued so I cannot get anymore even if I wanted to. But as I 'retire' old lines I will be introducing new styles to replace them, so there should always be plenty of styles to choose from. In fact I am already halfway through designing my second collection, which will feature snaps, patchwork, and also bibs for boys. Back soon with the shop opening announcement hopefully! The baby quilt is progressing.... slowly. I have completed the central embroidery and the Dresden plate that will go in the centre of the quilt (that's what the starburst shape below is called). The floral fabric in the Dresden plate is a discontinued Lecien line called Princess Rose, one of my all time favourite florals. I think the colours work well with the colours of the embroidery. Let me digress for a moment here. I am very fond of historical trivia, so as I was piecing the Dresden plate together I was curious as to why it was called that, so I googled it. It turns out it is named after the town of Dresden in Germany, which became famous in the Victorian Era with its fine decoration of porcelain plates with colourful flowers, fruits, and foliage. The 'Dresden plate' became a very popular quilt pattern in the 1920s and 30s, a time when Dresden porcelain was also hugely sought after. The pattern is called by other names as well, including Grandmother's Sunburst, Friendship Ring, Aster, Dahlia and Sunflower, though these are rarely used these days. So, there you go, a small piece of quilting history for you. Also, I found it fascinating that the plate on the right below is a plate for oysters. How wonderful! Anyway, back to the baby quilt. I have decided to make it bigger than the 'original version' of this quilt by Nana Company. Initially it will be used as a floor mat for Alice, who is now rolling (where has my newborn gone? 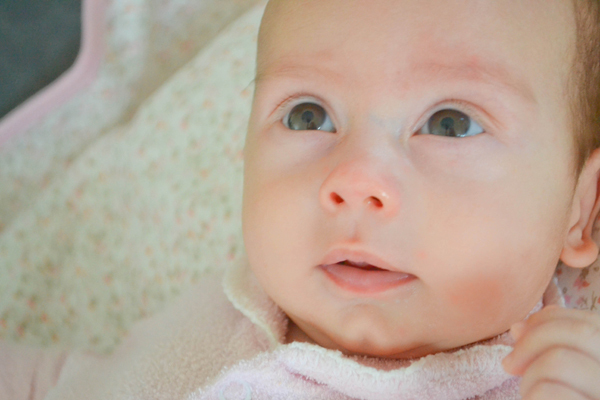 I blinked and she is 4 months old!). She therefore needs a lot more space for her floor adventures. So I will be adding a patchwork border or two to make the whole thing bigger. See the orange and green specks within the floral fabric? 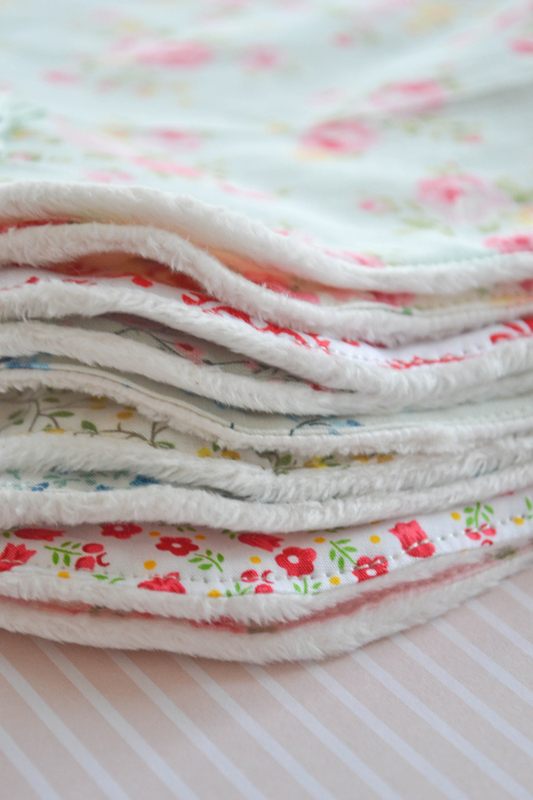 The border will feature those colours as well as the pinks and florals coordinating with the Dresden. This is a trick I picked up recently, and it applies to all patchwork items, not just quilts. 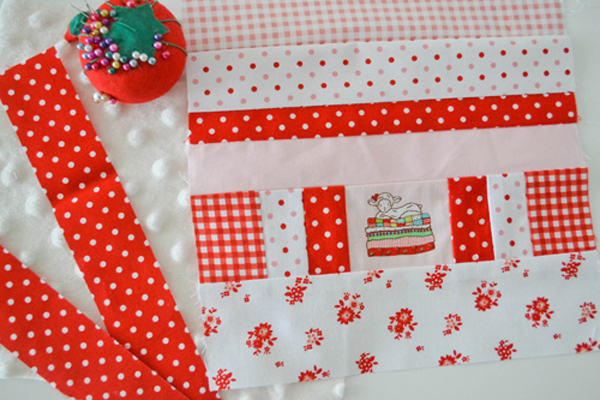 Every patchwork needs a few 'pops' of colour - otherwise it can look too flat and matchy-matchy. And the best colours to give that 'pop' are the colours of the little accents in the dominant patterned fabric, that you may not notice at first glance. It's all rather clever, really. Colour theory that is. I have seen so many quilts, painstakingly pieced together, and beautifully quilted, but they look a mess because the colours don't work together or the patterns clash. Getting the colours and fabric combinations right is so important, and possibly one of the hardest things about quilting. So I hope this one turns out OK! Once the quilt top is ready I am going to hand quilt it. I mean, why make life easy when I can make it difficult, right? Thankfully I love sewing by hand, and I also love the puckered hand-quilted look. It will take longer, but hopefully the result will be worth it. In fact, I have a bit of a confession to make here. This is not only my very first Dresden plate, or my first shot at hand quilting and binding, it is literally MY VERY FIRST QUILT (in fact that's what I may call it when it's finished - if I am not too chicken) . So a first in literally every aspect - except perhaps the central embroidery, which I am an old hand at. So please bear with me whilst I slowly work on this quilt, I am on a steep learning curve here. Also this little one is really keeping my hands occupied at the moment. In other news, I have just ordered a new 50mm portrait lens for my digital Nikon. Remember me talking about the importance of good product photography in craft blogs? Well my photos definitely need a lot of improvement, and my photographer friends tell me a good lens is the first pre-requisite. I can't wait till it gets here so that I can have a good play! And hopefully get around to taking that self-portrait photograph too. 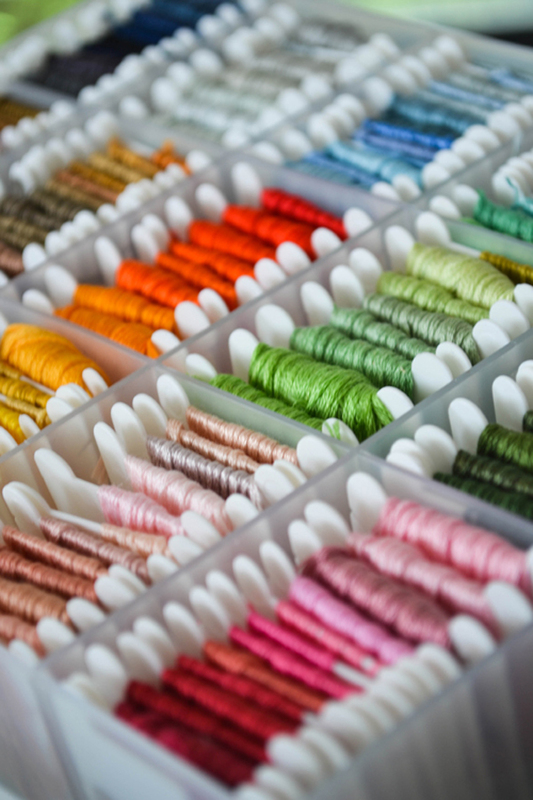 I am discovering that this blogging business isn't as simple as it looks, and that to be a succesful sewing blogger it isn't enough just to be a good sewist with inspirational ideas. You need so much more! You need to have a semi decent camera and know a little about photo composition and an eye for framing a shot, so you can take pictures that are visually appealing and don't look like something taken by a child on a mobile phone in a badly lit room. You need to be pretty good at using photo editing software like Photoshop, and if you are drafting patterns, a software like Adobe Illustrator to help draw them up nicely. You need to have an appealing writing style and be able to put your ideas across well on the page. You need to know your blogging platform well so you can customise and edit the 'style' of your blog, and have some HTML knowhow (or at least, know someone with HTML knowhow!). And amongst all this somehow you need to find the time to actually do some sewing! It is a tricky business for sure. No wonder there are so many failing craft blogs out there! When I first started this blog I just wanted to get it rolling and then 'tweak' it along the way to make it look the way I wanted it to look. I quickly realised that that plan was not going to work. It is not that easy to change a blog's design without having to re-do a lot of work on the old images and posts, so I had to do it sooner rather than later. Then I had a bit of a lightbulb moment the other night - I was looking at the blog and noticed all the empty white space on the right, where there was a column reserved for widgets. I am not a big fan of 'widgets' - also known as blog bling - as I think all the baubles and bells and whistles distract from the actual content of the blog itself. All that wasted space - which I could have used for bigger pictures showing more sewing detail. Also, I liked my original logo, but I wasn't 'in love' with it. It was a bit too fussy and frumpy for my liking, I wanted something simpler, more modern, and, well, cuter. So finally this weekend I put my sewing aside and sat down at my computer to re-style the blog. Those who know me well will tell you that I can be a bit of an over-perfectionist when it comes to things. 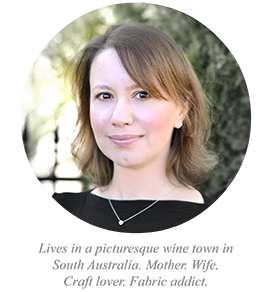 There are so many gorgeous ready-made templates to choose from on my blogging platform, but oh no, I had to design something from scratch so it would be 'just right'. So it took me all weekend! And with some help from my husband too. I have a little more fine tuning to do, but the fundamentals are all there. I have no doubt I will make further style changes along the way and fix problems as I learn more about blogging, and probably a major re-design or two will be on the cards sometime. But for now, I am happy with it. I hope you like it too. There is only one final thing I need to do to complete the re-design - a half-decent photo of me and not one taken in a cafe on a mobile phone with daylight streaming in from behind! I am the photographer of the family so, believe it or not, that is the only semi-acceptable recent photo of me, on my own, without a cute kid or two hanging off me. I think I may have to take a mirror self-portrait soon. The embroidery I added to the baby gifts made me realise how much I have missed working with tiny stitches. So I had to immediately start an embroidery for my next project. 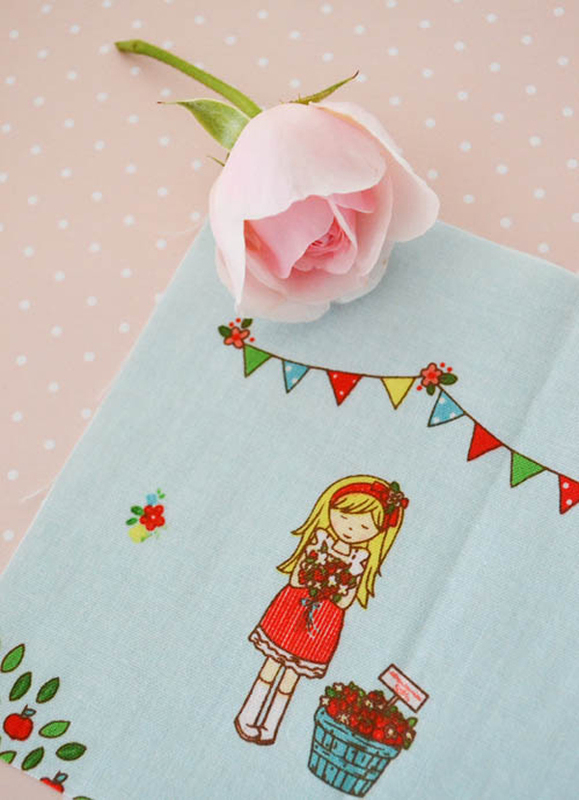 My love of sewing started with cross stitching when I was a little girl. Over the years I have made many tapestries and cross stitch pictures, including quite a few big ones. And I mean big, some of them are over a metre wide. I will share some of these with you soon. Here is one I made for Alexander last year. 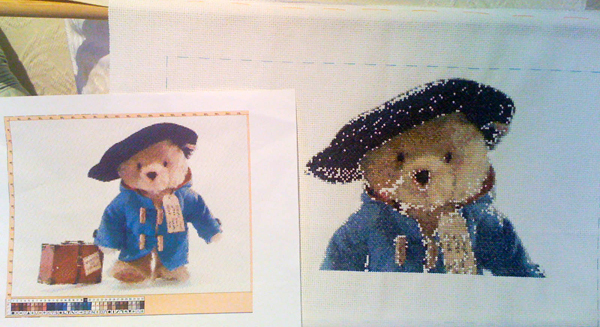 I designed the cross-stitch pattern myself (using a google image and specialist software, I am not that clever! ), and started stitching whilst I was pregnant with him. In the end it took me a year to finish it, here is a 'during' and an 'after' shot. It looks fantastic on his wall. And this here is what I am working on at the moment. It's a quote from Mother Theresa and the pattern is from the wonderful Nana Company. "We cannot do great things, but we can do small things with great love." It's really a very simple piece of embroidery, just back stitch, lazy daisies, and french knots. But absolutely beautiful in its simplicity! 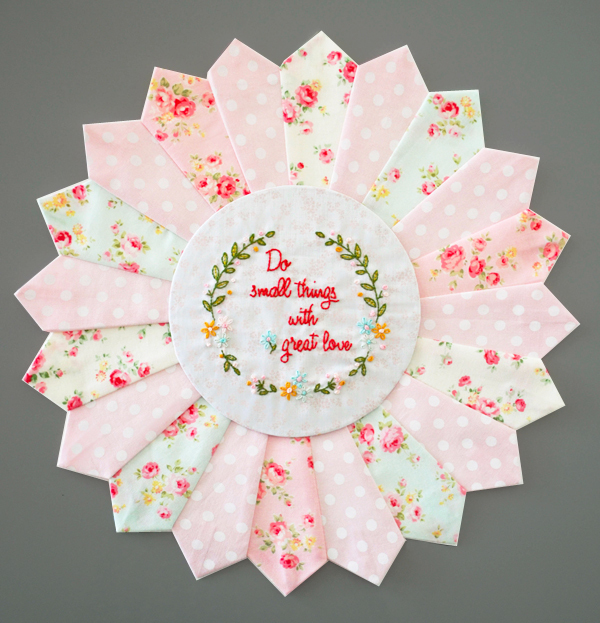 It will be the centrepiece of the baby quilt for my own lovely 'small thing', my little Alice. I started it yesterday and if it wasn't for constant interruptions from my two little monkeys I would have finished it by now! Anyway I love embroidering whilst relaxing in front of the TV in the evenings, so it will be finished tonight. My next project (a set of three pillows) will also feature embroidery as the centre-piece. 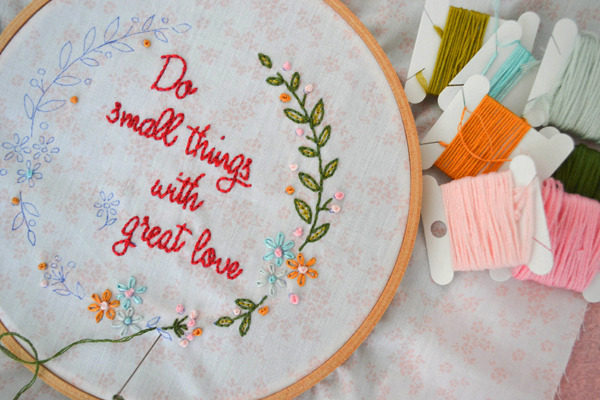 I absolutely adore tiny stitches! 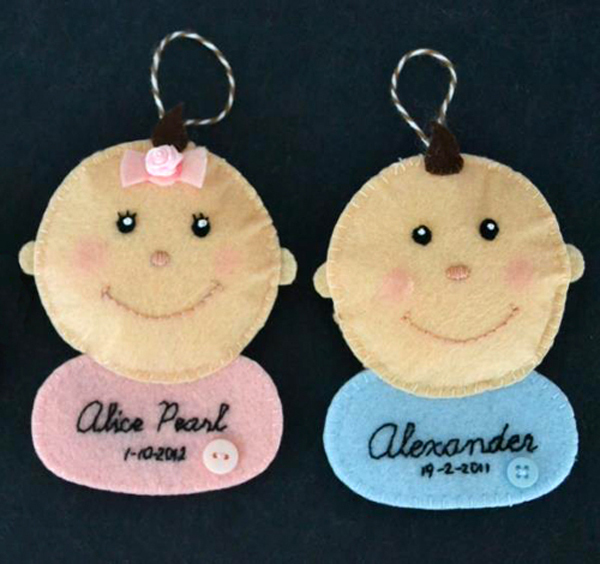 Well my friends got their baby gifts, so, ta-da, here they are! 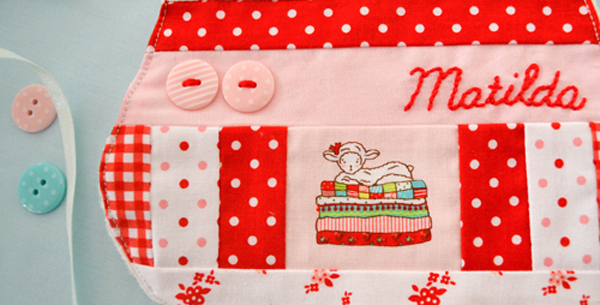 A patchwork bib for the gorgeous Matilda, and a soft baby cube for the lovely Pippa. 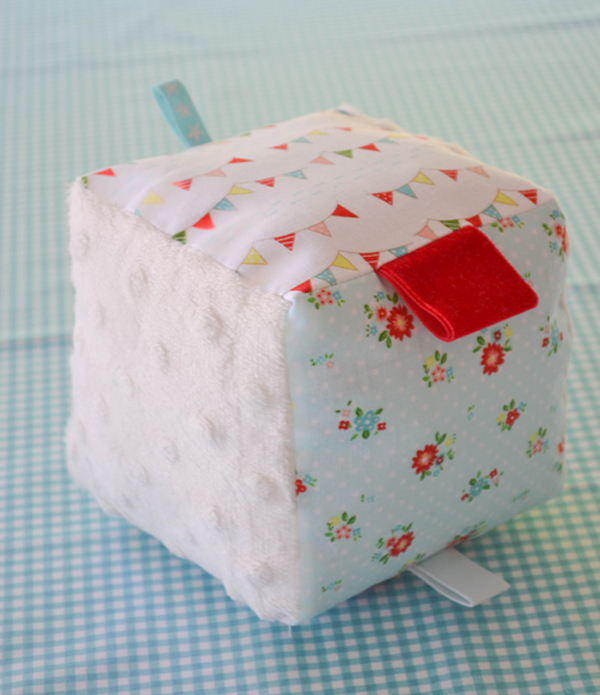 I couldn't help but do a little hand embroidery for the soft cube - the little girl from one of the fabrics used in the cube. I am slowly getting ready for the opening of the shop, I have ordered more fabric, packaging and wrapping materials. And I am redesigning my logo, I liked the old one but I want something simpler and more in tune with the style of my work. Next on my list - making stock for the shop (of course), and also some personal projects on the way. I have found three adorable embroidery patterns on Flickr which I will be turning into some pillows for the kids' bedrooms. I also started a mini-quilt for my little baby girl - sneak peek coming tomorrow! 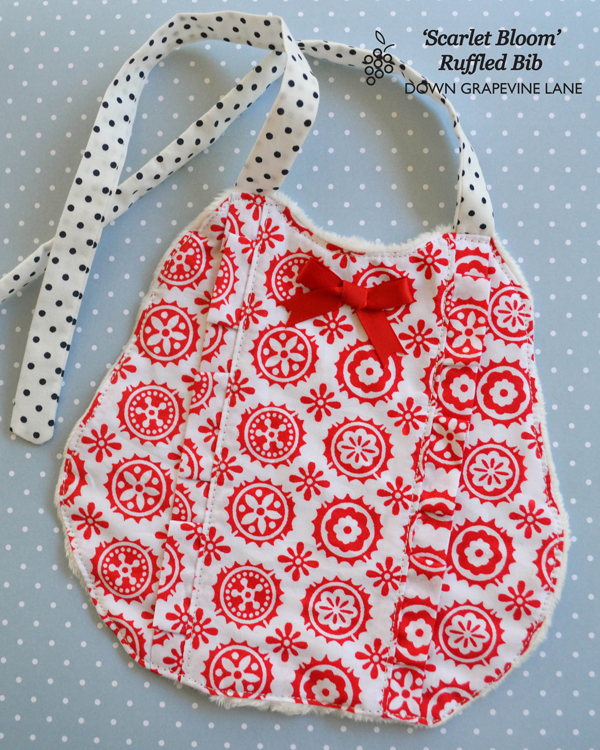 Here is the pattern and a simple tutorial for the Christmas baby ornaments I made recently. I am intending to write a series of tutorials on working with felt, so I can share my tips and techniques. So if you are new to felt, please stay tuned. Otherwise enjoy the pattern and the ornaments, and do let me know if you have any questions. 1. Prepare the face first. Applique the eyes to the face, then put a french knot with a single thread of white embroidery cotton in the middle of the eyes. Add 3 eyelashes for the girl (a single stitch for each lash). Embroider the nose with satin stitch, and the mouth with back stitch. Applique the bow and the hair on the top part. 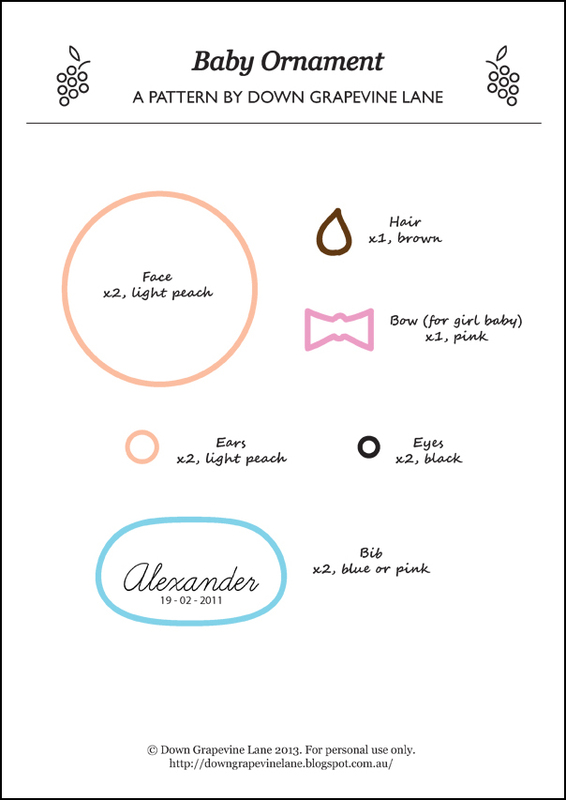 Add a fabric rose on the bow and a little blush if desired (I use ordinary make up blush and a cotton bud to apply it. 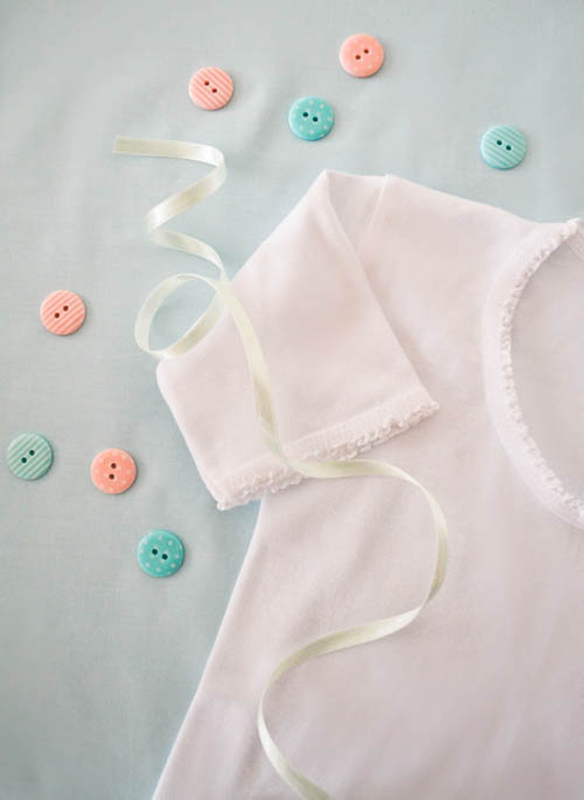 Get rid of the excess blush on the cottonbud on a spare piece of fabric first, before applying to the face). 2. 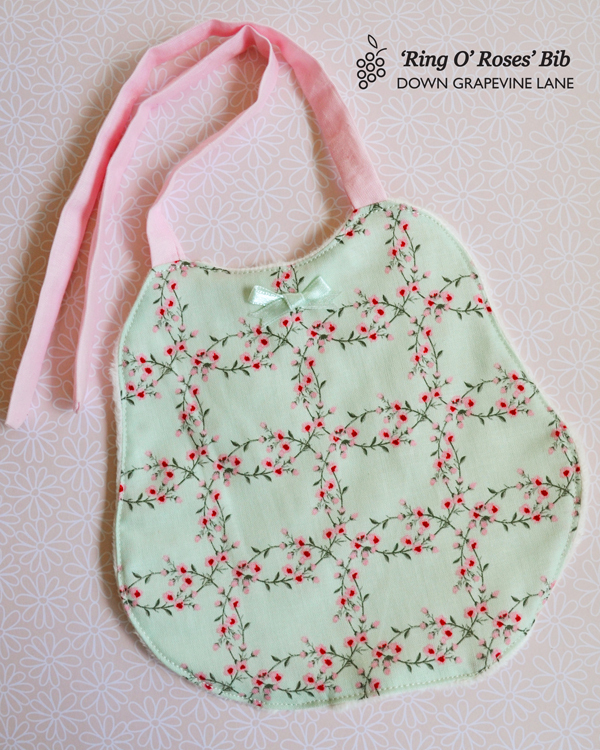 Embroider the name and date on the front of the bib. Add a little button if desired. Blanket stitch the back and front of the bib together. 3. Leaving a 3cm opening at the top, blanket stitch the back of the head to the front of the head, trapping the bib and the ears in the correct positions. Stuff the head through the opening, then finish blanket stitching the gap, trapping the loop of ribbon or string at the top. It has been a good weekend here, even though it has been raining. Our garden was in dire need of a good drink after the heat wave of last week (it went up to 42C!). The roses are looking a lot happier now. I am also a lot happier - I finally managed to get some good blocks of sewing time (a rare treat with two kids under two). 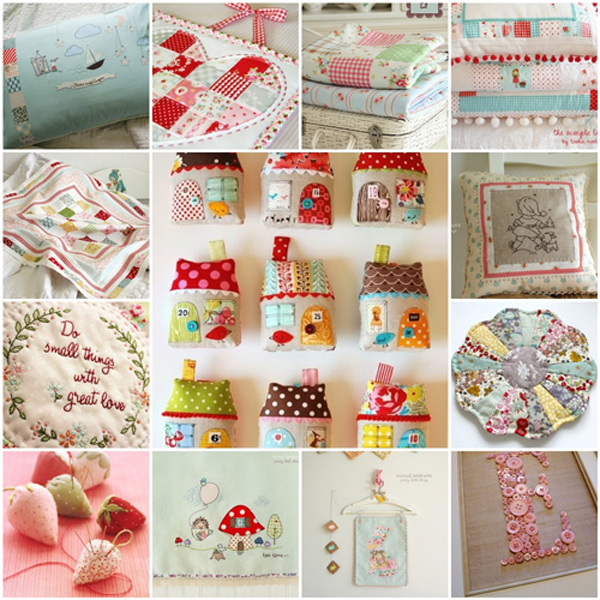 I made some baby gifts using Tasha Noel's gorgeous fabric line, The Simple Life. And Alexander had lots of fun playing with daddy in the rain. Happy times. The baby gifts when they were still works in progress. Can you guess what they are? And a cute little boy. A very messy one. A new stash of fabric. My embroidery floss box. I love the rainbow of cotton floss. And finally some adorable white t-shirts that my mum sent for Alice, just the perfect blank canvas for a cute applique at the front. Look at that gorgeous lace edging on the neck and the sleeves. If only I could decide what to put at the front. Any suggestions? I am not getting much sewing done at the moment. Little miss 3 months is having a growth spurt and feeding non-stop during the day, and absolutely refusing to go to bed before 10pm. Since I mainly sew after my kids are tucked up in bed, my sewing machine has just been sitting there gathering dust. 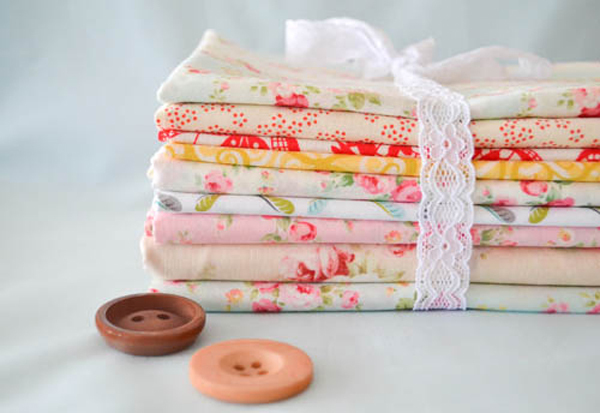 So instead I have been trawling through my favourite blogs to get my sewing fix. Here is a random selection of what's inspiring me at the moment. If only there were more hours in the day! 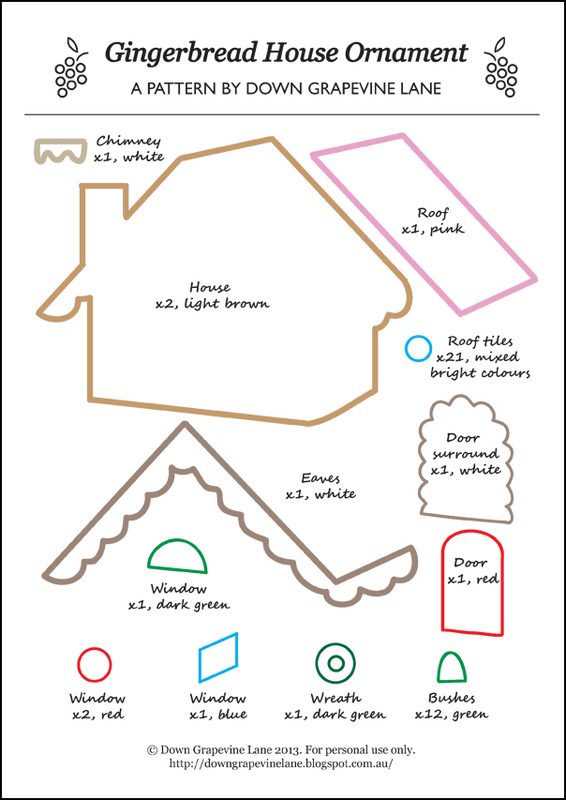 As promised in my previous post, I finally got around to drafting the pattern and writing the tutorial for the gingerbread house christmas tree ornament. I made this ornament as a new family Christmas tradition - a new felt ornament every year for both my kids, with their name and the year embroidered on the back of the ornament. This ornament was for my toddler, Alexander. He loved the colours and the sparkly sequins! 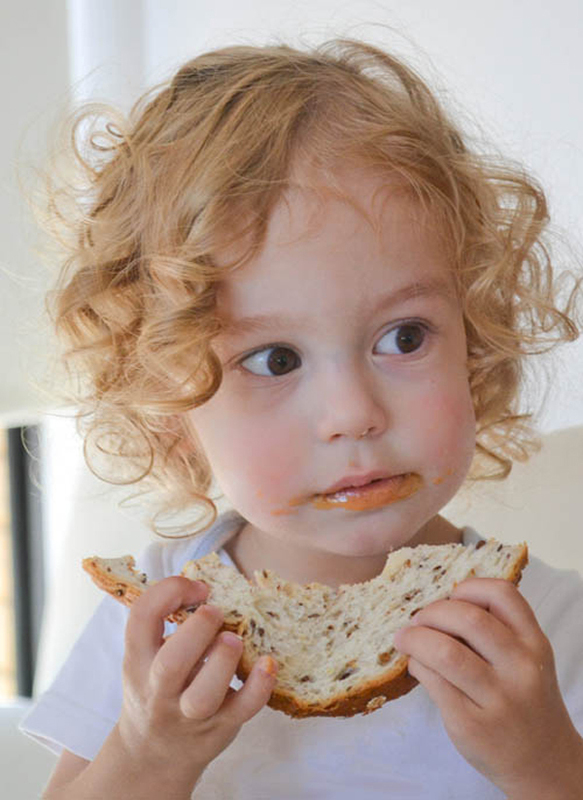 Though I had to rescue it from him when he promptly decided to see if it was edible. Thankfully felt is fairly saliva-proof! 1. Start with the roof. Attach each circle of felt onto the pink roof with a sequin and a seed bead (you can applique the circles onto the roof, but I find the sequin holds them in place securely). I used clear glass seed beads as they work with every sequin colour, but if you have coloured seed beads they would work too. To attach a sequin with a seed bead, put a single strand of embroidery thread on your needle (I use white with clear beads), go up from the back through the felt, put your sequin and bead on the needle and then go back down through the centre of the sequin (but not the seed bead) and fasten off at the back. Applique the roof onto the brown house piece. 2. Sequin and applique the white eaves onto the house. 3. Applique the white chimney piece onto the house. 4. Sequin and applique the white door surround onto the house. 5. Embroider the door panels with light blue backstitch (2 threads), then attach the green wreath onto the red door with 6 red french knots. Applique the red door onto the white surround. 6. Sequin and applique the bush pieces, starting with the one at the top of each 'pyramid'. Then the two pieces in the middle row, and finally the three pieces at the bottom. 7. Embroider the green window with light blue backstitch (1 thread), then decorate with red french knots or red seed beads. Applique onto the house. I also added some red and white felt balls under the window but that's optional. 8. 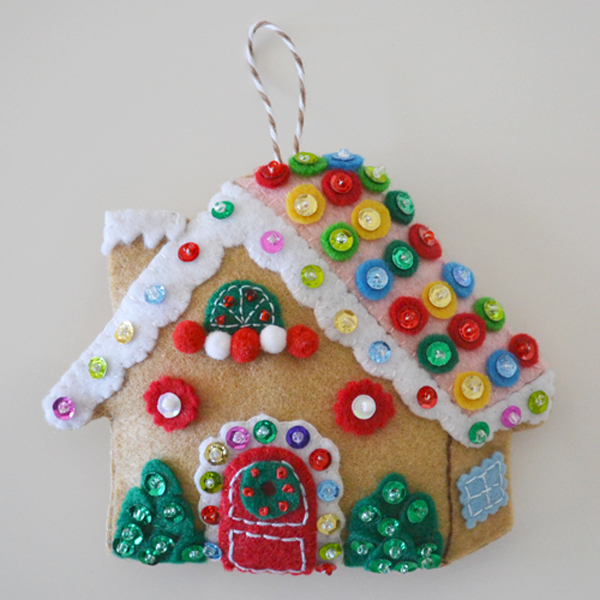 Attach each red window onto the house with a white sequin. I cut these and the blue window with my scallop edge pinking scissors for a bit of extra cuteness (optional). 9. Attach the blue window onto the house with light blue backstitch (1 thread). Run a line of brown backstitch up the corner of the house. The front of the house is now finished. 10. Embroider name and date on the back house piece if desired. Starting on the top right corner of the pink roof, and going clockwise, blanket stitch the two pieces of the house together until you get to the top left corner of the pink roof. Then use the opening at the top to put some stuffing into the house. Make the ribbon / string into a loop, insert into the opening and blanket stitch the opening closed, trapping the ends of the loop inside. I used baker's twine for the loop but you can use ribbon, packing string, or even ric rac.